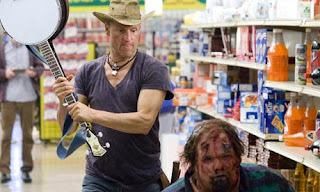 Zombieland: Like Ghostbusters for the new millennium, Zombieland pins Woody Harrelson against a slew of flesh-eating zombies that threaten to extinguish the world one bite at a time. Part funny and part scary, this creepy flick has already reigned supreme at the box office. Check out the trailer here. The Stepfather: With stepdads like this, who needs enemies? Dylan Walsh scares the jeepers out of his stepkids in this upcoming flick about the perfect stepdad with a deadly alter ego. Check out the trailer here. The Stepfather is in theaters October 16. Paranormal Activity: This Twitter darling has gotten major rave from fans and industry folks alike and has even incited high demand from cyberspace horror movie junkies. Reminiscent of The Blair Witch Project (but in my opinion a whole lot scarier-looking) a couple is haunted by the presence of a demonic spirit while they sleep in the middle of the night. Paranormal Activity is in theaters November 5 (okay this is past the October deadline, but still creepy enough to mention here). Check out the freaky trailer. Cirque Du Freak: The Vampire's Assistant: Capitalizing off the obsession with vampires this year, Salma Hayek returns to the big screen in a ghoulish flick about a young boy who in one swift move reignites an age-old war in the underworld between two feuding vampires after visiting an illegal freak show. Dragged into a world of undead misfits, the young teen develops unholy powers he hopes to use to end the war in the underworld. Based on the popular children's book series, Cirque Du Freak could be for a younger audience, with the exception of adult violence and language. The flick is in theaters October 23. Check out the trailer here. Saw VI: Yes you read it right. Saw is back for a sixth round of scare tactics for unsuspecting victims. This time with a new puzzle to solve and new fears to invade, the flick changes the game and the players involved. Check out the trailer for Saw VI (in theaters October 23) here. Which flick will you see? Want to see Zombieland and definitely been following the growing buzz about Paranormal Activity! Just read that Steven Spielberg was chilled to the bones seeing a special preview of it! I'm not ashamed to admit that I'm a big ol' scared-y cat! I couldn't sit through any of these movies. The previews for Stepfather look scary as hell! Saw Zombieland. Surprise hit of the summer! Paranormal Activity also looks like an interesting film.